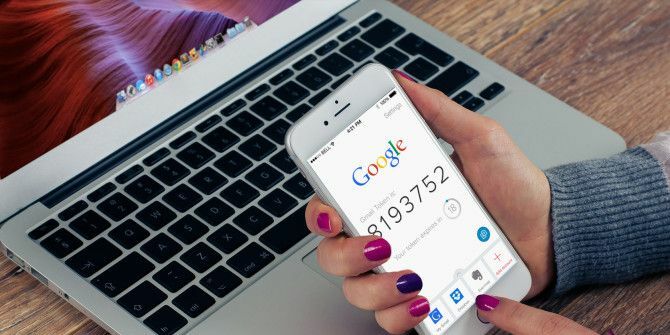 If you use Google’s two-step authentication What Is Two-Factor Authentication, And Why You Should Use It What Is Two-Factor Authentication, And Why You Should Use It Two-factor authentication (2FA) is a security method that requires two different ways of proving your identity. It is commonly used in everyday life. For example paying with a credit card not only requires the card,... Read More system to protect your Google accounts, you could accidentally get locked out. It’s one of the biggest risks of two-factor authentication 3 Risks and Downsides to Two-Factor Authentication 3 Risks and Downsides to Two-Factor Authentication Two-factor authentication use has exploded over the last decade. But it isn't perfect, and can come back to haunt you if you aren't careful. Here are a few overlooked downsides. Read More . And if you can’t get a mobile signal, then you can’t get the needed SMS messages in time. What can you do? You fall back on one of the oldest storage systems known to man: paper. I recently asked a few of my tech-savvy friends if they knew about backup codes for when Authenticator fails. Most of them didn’t. It’s probably because we can’t imagine the idea of relying on paper as a failsafe for security. But that’s the whole logic of it. Google provides a set of 10 codes that you can use as keys to sign in when you can’t get codes via text, voice call, or Google Authenticator. New sets of keys can be generated any time on your account page, but every new set will make the old one set inactive. After you generate a set of Google verification codes, you can save them as a text file — or better yet, print them out and keep in a secure place. Sign in to your account at go to the 2-step verification section on the Security page. Look for the “Backup codes” area. Click Setup or Show codes. You can print or download them as a text file. If you ever suspect that this set of codes might have been stolen or you’ve used many of the backup codes, you can generate a new set by clicking Get new codes. When asked for your verification code, click More options. Click Enter one of your 8-digit backup codes. Notice the checkbox next to the codes in the earlier Download or Print screen? As each code can be used only once, you can use the boxes to keep track of them. This is a simple security feature that helps to keep your account safe. It takes five minutes to set up but saves you a lifetime of bother. Have you used the backup option on paper or as a text file? Has it ever proved its usefulness when normal authentication failed? Explore more about: Google, Online Security, Two-Factor Authentication. PLEASE I NEED HELP ON THIS ISSUE. Earlier last year i opened a gmail account of which i used to apply for AdSense for my blog . Along the line, i set up 2-step verification for the gmail account and also set my phone as the only recognised device for the account. But unfortunately around December last year my phone got spoilt and since then, i haven't been able to access neither my gmail account nor AdSense account. I have tried everything to let google know that the account belongs to me but they always keep replying that "they're unable to verify the account belongs to me". Right now, I'm tired of the whole stress and i have decided to open another gmail account and reapply for AdSense but since the other (unaccessible)AdSense account is still active on my blog even as i no longer gain access to it, please how do i cancel and disconnect the old AdSense account from my blog so as to paste the code for the new one i will apply for; since one can't used two AdSense accounts on one site or blog?